Jeffrey Wang is 17 years old and is from Woodbury, New York. An upcoming high school senior, he is an avid musician and conductor, and attends Mannes College The New School for Music. In addition, he is a 2012 USAJMO qualifier, president of his school's "Mathletes" club, an ARML participant, and a fencer. 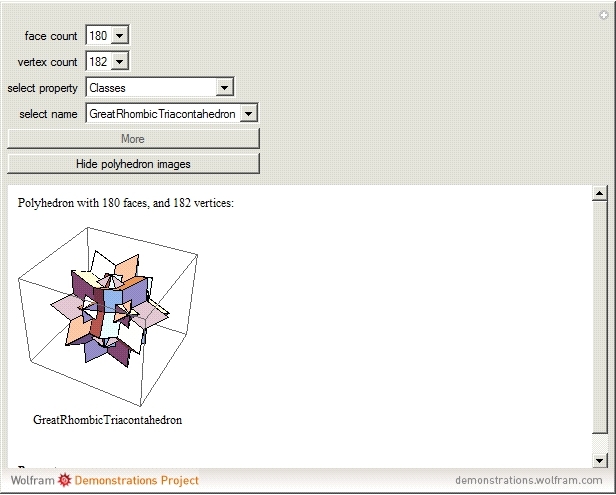 Users can select from a range of available faces and vertices and explore the various properties of each polyhedron.